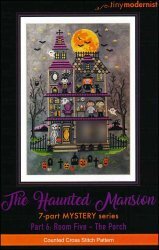 The Haunted Mansion Part 6: Room Five - The Porch [H1986] - $2.00 : Yarn Tree, Your wholesale source for cross stitch supplies. Cross stitch pattern from Tiny Modernist. Happy Halloween from Mr. Bones! Enter at your own risk! The laboratory is brewing chemistry experiments, the library has whispering ghosts, the witch is stewing dinner & Dracula awaits your greeting in the living room. Knock, knock, door number 6 will be opening shortly, who do you think will appear? Stitch count is 156W x 224H for the full design.